“How-To Steps” and “Insider Advice” for getting the most effective Mite Avenge application. 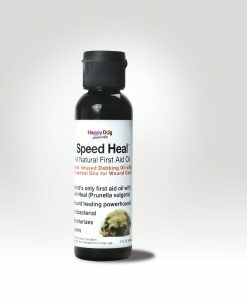 Need Less Than a Full Bottle? Take stock of where you’re at. The most powerful tool you have is positive intention. You know you’ve got this. Release any fear or negativity and allow only positive energy. Approach every step of the process for the rest of this journey with mindful intention. This changes EVERYTHING. Call us for a pep talk if you need a boost. Give your dog a haircut. By nature, dog hair is designed to shed water. Long hair, thick hair, and double coats can work against getting the saturation required to flood Mite Avenge deep below skin level where we want it. Treatments are more effective (and skin health is improved) with a new ‘do. Don’t clean yet. Sarcoptic mange is contagious. You will need to get the mites out of the house too. But don’t bother before Treatment Day. Mites will drop off your dog onto the dog bed, your furniture, clothes, and carpets. Go shopping. This is optional but it will help you get the most out of your Mite Avenge treatment. Obtain a closed container slightly larger than your dog. Depending on your pet’s size, this could be a plastic sweater box, Rubbermaid-type plastic tub, drywall pan, portable dog washtub, etc. 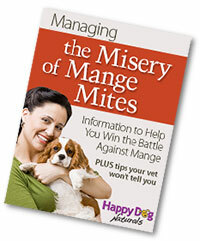 Bathe the dog, then apply Mite Avenge – You’ll do this once every seven (7) days for a total of three (3) applications. With proper environmental decontamination, this will clear most mild to moderate Sarcoptic infestations. Treatment Day = Kill Time! Create a clean-room. Just before beginning your first Mite Avenge treatment, decontaminate one room with a door so you can confine your pet(s) temporarily after treatment. This is your clean-room. 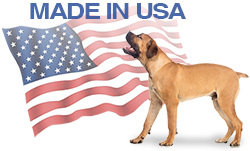 Don’t allow your dog(s) into the clean-room until after their Mite Avenge treatment. See Decontamination Tips at the bottom of this page. Prep. Mix the Mite Avenge solution in the applicator bottle according to direction. Mix the entire bottle of concentrate. Do not mix a portion as it is difficult to get the ratios right. Have the prepared Mite Avenge solution, your plastic container, shampoo, protective eye drops and/or anything else you anticipate needing at the ready. Wash your dog. Wash your dog. Any shampoo is acceptable but you may want to try FLUSH & KILL Shampoo as its added essential oils may accelerate eradication. Apply Mite Avenge. Close the tub drain or better yet, place your clean wet dog in a watertight closed container that’s slightly larger than your dog. (Depending on your pet’s size, it could be a plastic sweater box, Rubbermaid-type plastic tub, drywall pan, portable dog washtub, etc.) 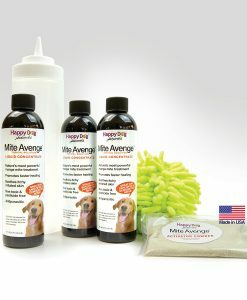 Completely saturate your dog with Mite Avenge by applying the solution uniformly across all areas of the skin and fur. Use every drop necessary to soak the dog down. Do not discard the Mite Avenge runoff that will collect in the bottom of the plastic container as you will want to recirculate it for a thorough drenching. Work it in. It’s not enough to simply pour it on. Mange mites are too deep and hair repels water. Push hair against the grain to reveal the skin and continually recirculate the runoff from the bottom of the tub over your dog. Repeatedly flood the same areas to get the solution under your pet’s skin where the mites hide Carefully treat all facial areas, wipe out the ears, saturating everything, everywhere. To avoid getting shampoo or Mite Avenge in the eyes, we suggest using a washcloth that provides more control than the mitt we send. Do NOT rinse Mite Avenge off. Allow to slowly air dry. Do not force air dry or use direct heat. Pat paw pads and between the toes thoroughly dry. Once treatment is complete, apply praise liberally, and discard any remaining Mite Avenge runoff. Shower and change clothes. Avoid contact with your dog until you’ve ditched your clothes outside and scrubbed down. A few desperate survivors may have jumped ship and are now on you. Move your dog to the clean-room. Finish cleaning. You must decontaminate the rest of the household to avoid reinfestation by these aggressive mites. The decontamination tips at the bottom of this page will help you. Shower and change clothes again. One last scrub down to take care of any mites that might have been picked up during the decontamination process. Short haired dogs under 30 pounds may not require a full 24 oz. of Mite Avenge for a successful treatment. Mix a full bottle of concentrate as directed. Place the dog in a closed container (as explained in the enclosed treatment instructions) and apply mixed solution liberally. Use enough solution to thoroughly drench the coat down to skin level then set the applicator bottle aside and continue treatment as instructed. To avoid product degradation, proper storage of remaining activated Mite Avenge is critical. Immediately store any leftover solution in a dark place to prevent light degradation. Store product at room temperature. Avoid extreme temperature changes such as refrigeration, heat sources or outdoor areas where temperatures fluctuate. Do not warm leftover solution to a temperature greater than 100º F (essentially no warmer than a baby’s bottle). Correctly stored solution should remain viable for 7–10 days. Re-infestation is guaranteed, and everyone is liable to start itching again if mites remain in and around the house, apartment, garage, yard, porch, and vehicles. Wash all pet bedding and any clothing, towels, bedding or other washables that renegade mites may have contaminated. Add a cup of 20 Mule Team® Borax to each load of laundry and wash in the hottest water possible. Dry on the highest heat possible. High heat will kill any eggs. Vigorously vacuum everything you can — floors, rugs, upholstery, etc. Take steps to avoid redistributing mites and eggs while cleaning. When using a vacuum with bags, change the bag after each use and dispose of the bag outside. If using a bagless vacuum, place a small amount of salt in the collection container before vacuuming to shred and dehydrate the mites. Empty and wash the vacuum’s collection container outside. If possible, steam clean carpets and upholstered items. For optimal results add borax powder to the steam cleaning mix. 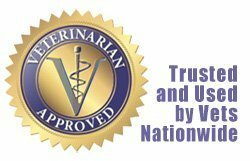 Apply Food Grade Diatomaceous Earth (DE) on surfaces or areas that cannot be thoroughly vacuumed, such as vehicles, kennels, pens, deep-pile rugs, yards, cracks, crevices, upholstered furniture, between cushions and mattresses, etc. DE is a natural non-toxic powder that is deadly to insects. Consisting only of finely ground freshwater shell, the dust damages the exoskeleton of insects and parasites, causing death by dehydration (always use food grade; agricultural or pool grade usually have additives that can harm your pet)! 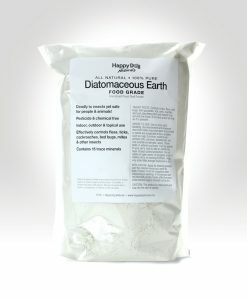 If you don’t have it, Food Grade Diatomaceous Earth is available in our online store. Items such as throw pillows, area rugs, furniture etc. can be sealed up in trash bags (or wrapped tightly in plastic) then removed to an isolated area for a few weeks. The mites will self-exterminate in that time. Shower and change clothes before retrieving your dog from the clean-room. Execute these steps carefully and thoroughly to set up your clean-room, and then after the first Mite Avenge treatment when you do the whole-house cleaning. Mite Avenge 3-Pack, plus options for recommended treatment items.